Freedom is something that we all want, for each of us that comes in various forms, and that could be in smaller or bigger scales. To help you towards your dreams of living in a "free world", you need to try to put that liberty into your financial goals as well so that you'll be taking all of the proper steps to build a better future for yourself. If you're ever been in a situation in the wee hours of the morning where you're crouched over a pile of late bills and stressing over how you're going to be able to afford them, than you know what this means. Or, if you live paycheck to paycheck with no extra money for vacations or "fun" money, then read on. Is there such a thing as financial freedom? 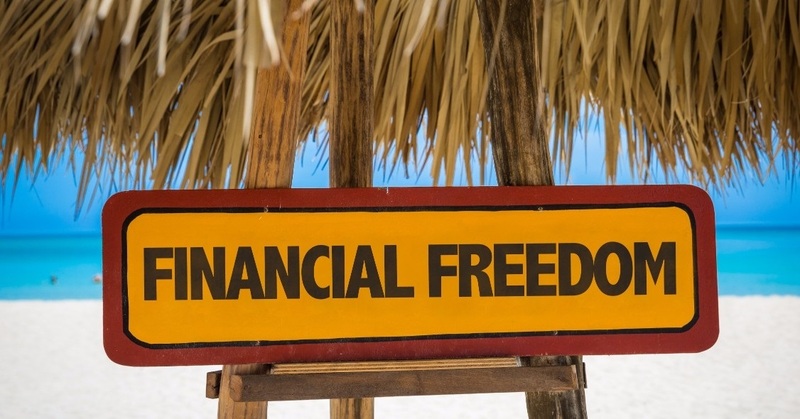 Though you may not know much about it, financial freedom is a real thing. It's the idea of making good choices and recognizing that you are in control of your money. Financial freedom could be about getting on top of your debts and bills – which is certainly a good thing to work towards – but, it's also about understanding that you have the power and free will to make good choices and to start making those great steps forward. It starts by recognizing the idea that you can make choices. Instead of going all out and splurging on a new wardrobe every month, try making a better choice of getting a few articles of clothing that you really love and wear the heck out of The difference in the monthly bill will be much more in your favor. Plus, you can make a day of hunting for the bargains in order to stay within your budget. Another option is to consider switching out your weekly movie dates for monthly ones, etc. What this all means is that you have the amazing ability to make a choice about your financial goals and your life. You'll be able to see that you can change your life with little decisions like these. You can decide to buy the cheaper brand, or skip out on an extravagant trip that you don't actually want (maybe need is the better word) to go on. It's all about free will and exploring the things it can do for you. If this is sounding like something out of your league, or like a dream come true, understand that you can do this. Take a look at your spending habits (your weaknesses and problems as well as your strong points) and then get the advice of a financial professional. Working hand in hand with a planner will make your goals accessible so that you can get that financial freedom you're hoping for, and the sacrifices that you're making (or the choices that you aren't making, like that trip for instance) aren't going to feel like big losses at all. You'll be making better choices and seeing the positive results in no time. Financial freedom is right around the corner, all you have to do is make better choices and get the professional guidance you need to help you stay on track. If you need help with navigating your financial freedom, being held accountable with your financial goals and someone to help keep you on track, contact GPS Wealth Management today.